Home > Is OB/GYN just for pregnancy? Is OB/GYN just for pregnancy? Have you ever wondered exactly what an OB/GYN is? OB/GYN is the abbreviation for obstetrician/gynecologist, and means that the person with this designation behind his or her name is a physician specialist, a doctor who has chosen to specialize in the care of women and their reproductive health. The field of obstetrics deals specifically with pregnancy and birth, while gynecology involves the care of the female reproductive system outside of pregnancy. An OB/GYN can provide medical and surgical care to women, and because of specializing in these fields has expertise in pregnancy, childbirth, reproductive system disorders with control, and other health issues specific to women. Because of this expansive expertise, OB/GYN is not just for pregnancy; you may even choose to have an OB/GYN as your primary care physician, depending on your individual health care needs. Your OB/GYN can coordinate care with a specialist in another field of medicine, if a condition is present which requires special care and treatment. Within the OB/GYN designation there are four primary subspecialties; gynecologic oncology, reproductive endocrinology and infertility, maternal fetal medicine, and female pelvic medicine (which includes reconstructive surgery, if necessary). Gynecology is not limited to “everything below the waist” as some people believe. Your OB/GYN can take care of breast problems as well as doing pap smears, diagnosing and prescribing treatment for menstrual problems, performing dilation and curettage (D&C), tubal ligations, pelvic ultrasounds, endometrial or uterine biopsies, and treating chronic or life-threatening conditions such as endometriosis, cervical cancer, uterine prolapse, and ovarian cancer. As you can see, an OB/GYN is trained in more than just delivering babies and treating pregnant women. We here at Colorado Obstetrics & Women’s Health provide personalized, comprehensive care for all phases of a woman’s life, not just when you are carrying a child. 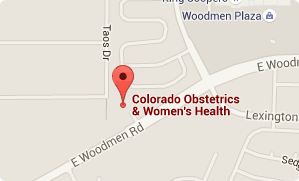 We are dedicated to providing Colorado’s female population with complete healthcare. Give us a call today at (719) 634-8800 to schedule an appointment. We look forward to helping you achieve your best health.